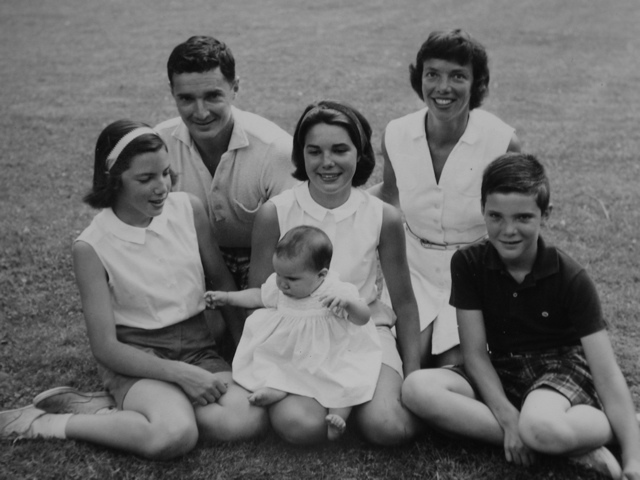 Frank and Jean pictured with Susie, Marsie, holding baby Edie and Frank III in the 1960s. Francis C. Farwell, II, Frank, a devoted family man and cixic leader, was an Chicago investment banker for over 60 years, senior partner in the firm William Blair and Co. He served as Chairman of the Board of Governors of the Midwest Stock Exchange from 1973 to 1976; on the Securities Industry Association’s governing council, 1977-1979; the National Securities Clearing Corporation board of directors, 1979-1983; and on the boards of the Chicago Botanic Garden, Chicago Zoological Society, Shedd Aquarium, YMCA of Chicago; Illinois Nature Preserves Commission and the CROYA Foundation of Lake Forest; Lake Forest Open Lands, from 1982 onward as president from 1990-1993. For 52 years he was on the board of Lake Forest College, the last 21 as a life trustee; He was a leader of the institution's 150th celebration in 2007. He attended the Pomfret School in Pomfret, Connecticut, and then Yale University, from which he graduated in 1944. His college years were interrupted by World War II, during which he served three years in the U.S. Army Air Corps, a lietenant, piloting various troop transport aircraft between tiny coral airstrips in the Pacific, often unprotected from faster-flying Japanese fighters. Mr. Farwell was a golfer, an outdoorsman, an avid preservationist and conservationist and an accomplished tennis and squash racquets competitor, an Illinois State Squash Doubles Champion. In his hometown of Lake Forest, he served as an alderman from 1976-1982, and as mayor, 1984-1987, the sixth member of his family to do so. When Farwell was mayor he was a "driving force" in getting community support for a bond issue to renovate the Forest Park Beach. His dad, Albert Day Farwell, was mayor in 1931-1934. His mother Edith Foster Farwell helped found the Chicago Botanical Garden. His great grandfather John Villiers Farwell helped found and served as mayor of Lake Forest in 1871-72, the era of the Chicago Fire that brought new families to town. He had a major wholesale dry goods firm in Chicago, one of the leading business enterprises in the United States, J. V. Farwell & Co. You can learn more about J. V. Farwell & Co. by clicking this link. An early business partner was a young Marshall Field. He was considered the force behind construction of Chicago's first YMCA in 1857. John's younger brother Senator Charles B. Farwell and his wife, Mary Eveline Smith Farwell, helped revive Lake Forest University after the Civil War so his daughter Anna could attend. He served as a trustee of what is now Lake Forest College from 1864 to 1896, also underwrote the construction of College Hall (now Young Hall), the women's gymnasium (now called Hotchkiss Hall), North Hall, and contributed the land for Farwell Field in 1902. John and Charles were among the first to build major villa homes in Lake Forest in the 1860s and 1870s. Frank and Jean created a magic family life..
...nurturing flower and vegetable gardens and enjoying the surrounding oak forest, which are now preserved in perpetuity as "the Jean Farwell Woods", as well their menagerie of dogs, horses, rabbits, ducks, pony, goat, pig–even two wild raccoons that commuted in an out of his daughters’ windows and became part of the family. 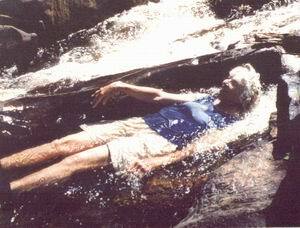 Jean cooling off in the Yellow Dog River. 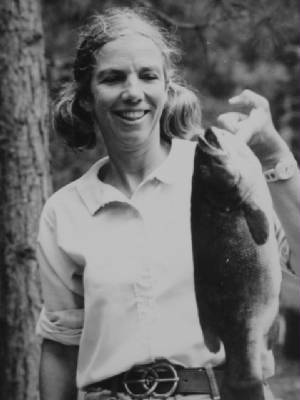 Read about the Jean Farwell Wilderness. flower beds and other natural settings. 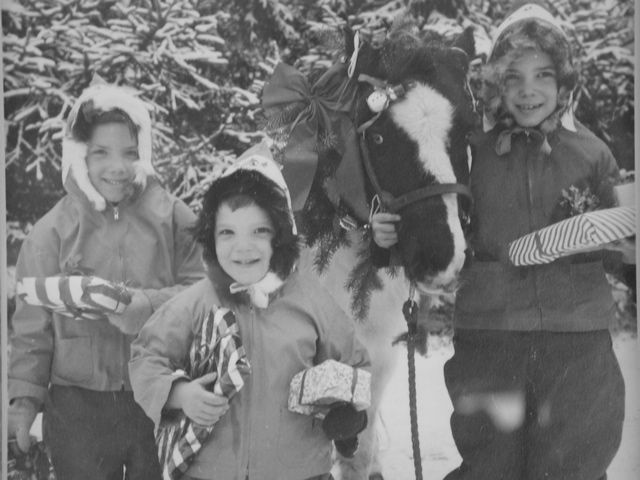 Family members said she had a charm that made her subjects, particularly children, feel at ease and her a success. In fact, customers talked her out of retirement in the early 1990s, but she finally was able to stop working in 1997. 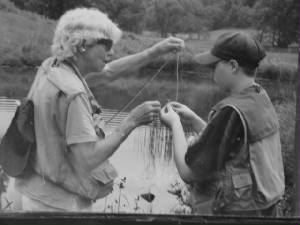 They used to say that Mrs. Farwell, "Jean the Teen," was the only adult that they were comfortable with as she showed them how to tie flies, cast and learn the intricacy of actually pulling a trout from the water.